Not a lot of family drama in this batch of episodes, so that was nice. 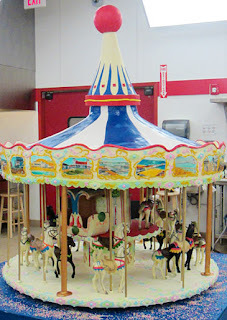 I would have liked to see more of the making behind the carousel cake, especially with the carving of the top part and such. I get kinda tired of seeing the same pranks over and over on this show - I understand that it's a fun work environment, but it's getting old. I also don't understand why we get two minutes of renovation every other episode... why can't we have a special that catches us up on the renovations and maybe shows the celebration cake being put together for the re-grand opening or whatnot? And, some big renovations are happening with the wallpaper, shelves, floors, and display case glass. Why do they try to transport huge fragile cakes pre-assembled? Why not put them together after transporting? It would definitely lower stress.